While enjoying gorgeous photos of pottery that only Japanese clay and firing techniques can produce, you'll gain a sense of what pottery means to the Japanese, from its use in daily life to its Zen connections. You'll also learn how to say not only "pottery" and "potter" in Japanese but also "He made me who I am today" and "I'm drunk on music." pp. 2, 6, 8, and 13: Fixed broken links. pp. 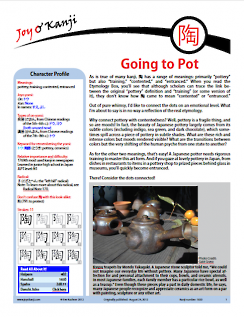 11 and 12: Significantly revised the passage about 陶冶 (including its definitions) and deleted Sidebar 3, which had accompanied a now-deleted sample sentence. 1. Reformatted the citations in the sidebar on pp. 7 and 8. 2. Changed "toys" to "'soft vinyl' toys" in the photo caption on p. 7. Aug. 24, 2012: Originally published.